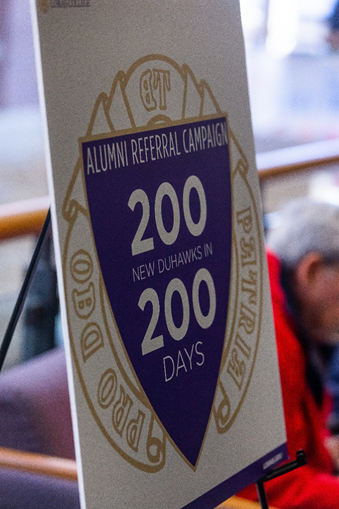 We’re nearing the finish line with our 200 in 200 alumni campaign. If Fr. Dan Knipper (’63) can do it so can you! Be one of the many alumni and friends who are sending us names and contact information of high school students who might be a great fit at Loras. We launched this campaign at Homecoming to increase our student referral base from alumni across the country. They’re coming in from Iowa, Illinois, Wisconsin, Michigan, Colorado and California. We’ve had some great success, particularly in the last 90 days, but we’re still pushing for our goal of 200 referrals by May 1. We need another 60 names to meet our goal. By clicking on the link below, you can add more students to our roster. You don’t need to know every detail, simply provide us with a name, how to contact the student and what year they are in high school. Let us take care of the rest. Thank you to Geri Tilkes (’89), Barbara Pinter (’89) and Skip Brennan (’64) for referring twenty-one students between the three of you. Be creative and share this on Facebook, Twitter, LinkedIn or another social media that will help us spread the word! Your referral today might just be what gets a future Duhawk to visit Loras College tomorrow. You can refer as many high school students as you wish and they don’t have to be seniors either. If you have any questions, please do not hesitate to contact Joan Schaefer at joan.schaefer@loras.edu.